In the following article Tristan Ewins argues that overcompensation is key to 'selling' the carbon tax' - and that welfare recipients should not be 'left behind'; But also that Labor needs a 'policy circuit breaker' NOW if it is to have any hope of re-election in 2013. A National Disability Insurance Scheme, and pay parity for community sector workers - could provide 'a way forward'. What is most crucial at this point is for Labor to implement some kind of policy “circuit breaker”, to stop voters from ‘switching off’ before it is too late. This was a devastating result for Labor. But a National Disability Insurance Scheme could provide the vital ‘policy circuit breaker’ needed so desperately by Labor. We will return to this issue later. The carbon tax is perhaps the most problematic issue for Labor, as fear has been whipped up so effectively by Abbott and by sections of the media. There are also tensions between the Greens and Labor. The Channel 7 website has published an article reporting a developing impasse between Labor and the Greens on the form any future carbon tax will take. Here assistance to coal miners seems pointless. Already low and middle income consumers – as well as trade-exposed industries - should be compensated for any increased flow on costs from coal-fired energy. If coal-fired energy plants are directly compensated, however, then where are the ‘market signals’ driving a shift to renewables? This author has argued in the past that there will likely be a rate of $20/tonne: a position that seems to be popular with Labor. But in the past the Greens have argued for a rate as high as $40/tonne. Melbourne University Researcher, Roger Darville blames this situation on the troika of renewable quotas, the need for new infrastructure, and increased demand. But privatisation is the real ‘elephant in the room’ with increased finance costs and profit margins for the private sector, and reduced market power for small consumers. (see: http://leftfocus.blogspot.com/2011/06/right-populist-monopoly-media-attempts.html ) And in any case increased demand should not simply translate into higher charges pocketed by private companies in the form of profit. Pensioners are already absorbing these and other costs (eg: water), and so should not be ‘left out of the equation’. From this it’s possible to draw a number of conclusions. Firstly, a higher carbon tax rate could provide more scope for overcompensation for pensioners, as well as low and middle income working families. In light of existing punitive active labour market policies there are no decent or valid arguments not to reform Newstart. And real increases to Austudy are also crucial to provide conditions where students can apply themselves fully to study, rather than risk failure or underperformance as a consequence of the pressures of part-time work. And here a ‘loans scheme’ is neither equitable nor fair. If reform is not implemented here in the context of carbon tax overcompensation, then it needs to be achieved separately; But progressive Labor figures on a cross-factional basis, and the Greens - need to demand reform one way or another during the current term of Labor government. Ultimately carbon tax overcompensation may prove the easiest path to reform regardless. But to achieve robust overcompensation for low and middle income groups difficult decisions need to be made about ‘cut off’ thresholds. Robust overcompensation for low-middle income groups will be crucial if Labor is to retain government in 2013; but must be paid for somehow. Therefore after reconsidering, the author believes that to provide the scope for such extensive overcompensation, a rate of at least $26/tonne – as preferred by Ross Garnaut – and with the ‘cut-off points’ suggested here - is preferable. And of course the rate and cut-off thresholds would have to be properly indexed. Finally, compensation might best be provided in the form of regular cash supplements (also indexed) – as otherwise tax cuts could be ‘taken for granted’ and forgotten. With regular cash payments there would be a constant reminder of compensation provisions. Labor has been taking ‘hit after hit’ in the polls and in popular media for a long time now. There are many publications which will put a ‘negative spin’ on pretty much anything and everything Labor says and does. The danger is that voters will ‘switch off’, virtually determining the government’s fate more than two years ahead of the next election. The carbon tax may turn out well ultimately, but a year from now it may be ‘too late’ for the government. The government needs a ‘circuit breaker’ and needs it now. Labor needs to break the cycle of fearful speculation now - with an agenda of constructive and visionary reform with which to inspire and engage the electorate. The National Broadband Network (NBN) helped Labor ‘across the line’ last time; but the government needs new initiatives, as well as substantial progress on the NBN. 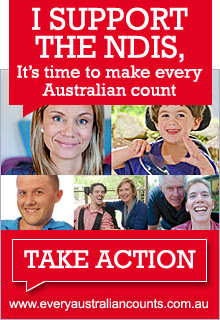 A National Disability Insurance Scheme has long been touted as an option by rising Labor parliamentarian Bill Shorten. In addition to this a NDIS needs to provide substantial new funds (ie: several billions every year) via a Medicare Levy-like mechanism rather than just a restructuring of the funding mix. New funds are necessary to increase Disability Support Pensions and Carers’ Pensions; extend support services and provision of necessary home infrastructure; and to bring more crucial medications under the umbrella of the Pharmaceutical Benefits Scheme. Specifically as a consequence of a NDIS, in current terms carers and disability pensioners should also receive a rise in their pensions of at least $25/week; indexed on top of existing pension formulae. A NDIS could also source additional funds for improvement of mental health services: an issue which is resonating strongly with the electorate. While a NDIS could disrupt the cycle of fearful speculation about a carbon tax, it would also comprise a landmark reform – a genuine record of achievement for Gillard Labor. Finally, the government could move onto the front foot regarding the ‘equal pay’ campaign being driven by the Australian Services Union – to provide effective pay parity for workers (mainly women) in the community services sector. Because it is mainly women who are employed in the sector, this issue has been raised as one of effective gender discrimination. But not-for-profit organisations providing aged care and other services (as well as in the public sector) will need support from the government in adapting to any improved regime of pay and conditions. Hence for these – and other vital reforms – the government needs to aim during this term for a sustainable expansion of social expenditure in the vicinity of 1.5% of GDP; backed by progressive tax reform. Generous superannuation concessions for the wealthy could also be wound back. But until the carbon tax is implemented – with accompanying compensation and overcompensation – some degree of fearful speculation will continue. Labor needs to finalise its carbon tax package soon – to put fears to rest. But speeding up implementation could also be crucial; and Labor could do well to aim for the end of this year, rather than allowing damaging speculation to continue until mid-2012. Again: by then it could be ‘too late’.